Northwest Housing Alternatives breaking ground on approximately $7 million project at 3 p.m. Thursday, Oct. 11, at 314 Pleasant Ave.
Northwest Housing Alternatives is breaking ground on 24 affordable housing units for veterans at 3 p.m. Thursday, Oct. 11, at 314 Pleasant Ave., Oregon City. Speakers will include NHA Executive Director Trell Anderson, Clackamas County Commissioner Ken Humberston, and veteran advocate Patti Jay. "Everyone needs a safe, affordable place to call home — and it feels especially important to ensure that those who have served our country in the military have such a place," Anderson said. "We are proud to provide housing for veterans in Clackamas County with this project." 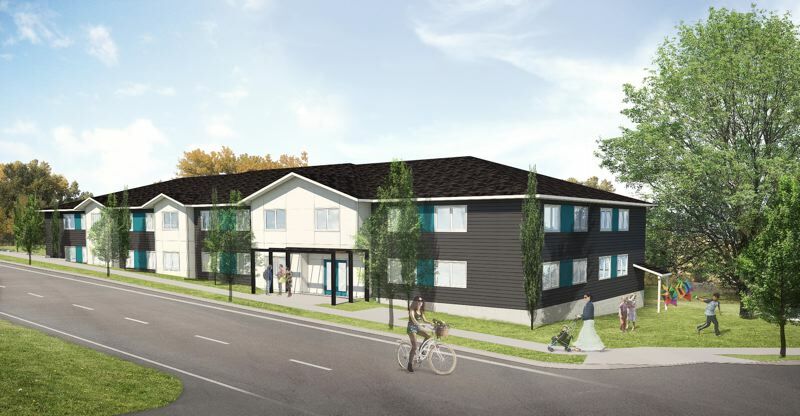 While NHA is developing the approximately $7 million project with the help of Walsh Construction and KASA Architects, the Housing Authority of Clackamas County will take it over when completed. NHA purchased the nearly 1-acre property near Molalla Avenue from the Clackamas Soil and Water Conservation District for $375,000 in 2016. According to the National Low Income Housing Coalition's 2018 Out of Reach report, those in Clackamas County need to earn over $25 per hour to afford a modest two-bedroom apartment, more than double the current minimum wage. Veterans, in particular, are at risk for homelessness, representing more than 10 percent of the overall population of people experiencing homelessness. The new development will include four studios, 12 one-bedroom and eight two-bedroom units. All units will be subsidized — 10 through Veterans Administration Supportive Housing vouchers and 14 through Housing Choice project-based vouchers. Funding for the project came from a variety of partners, including Oregon Housing and Community Services; Clackamas County; Meyer Memorial Trust; the Home Depot Foundation; JP Morgan Chase; Federal Home Loan Bank; and the Network for Oregon Affordable Housing. Clackamas County residents are encouraged to nominate a local veteran for whom they would like to see this project named. The nominated veterans need only to have served their country honorably. Those who wish to participate in the project naming process are encouraged to submit their nominations using an online form at www.surveymonkey.com/r/LB2WGPB by the Oct. 28 deadline. A review panel will select the winning name for the project's future commemoration ceremony that will honor all veterans. This project will provide affordable living space for veterans who earn at or below 30 percent of the area's median income. The new housing location provides access to public transit, grocery stores and health care providers. The project is expected to open next fall.